Is Short-Term Thinking Killing the American Economy? Many big corporations are more interested in returning cash to shareholders than investing in innovation. That might not be a bad thing. In the past year, a long-running debate has broken out into the open as numerous politicians have claimed that short-term thinking on Wall Street is hurting the U.S. economy. Pressure from Wall Street -- so the story goes -- leads companies to prioritize short-term earnings over investing for the future. Even worse, companies are spending hundreds of billions of dollars annually to buy back stock (and to a lesser extent, to increase their dividends) rather than pouring more money into research and development and capital expenditures to support growth. American companies are returning huge sums of cash to shareholders. Image source: The Motley Fool. Researchers have made some cogent arguments about the threat to the U.S. economy from short-term thinking. Nevertheless, these fears are overblown -- largely because critics of short-term thinking focus primarily on large, successful companies. Despite being successful, these companies aren't always in the best position to drive the economy's future growth. Innovation and productivity improvements are the key drivers of long-term growth in per-capita income. However, for any given company, investing in R&D to pursue revolutionary breakthroughs may not be a good strategy. There are countless cases of companies spending millions and billions of dollars in pursuit of innovation and winding up with little or nothing to show for it. Let's take a look at just three cases: Apple (NASDAQ:AAPL), Keurig Green Mountain, and Boeing (NYSE:BA). Did Apple investors get too greedy? Apple has become a popular whipping boy lately for critics of short-term thinking. In the past few years, Apple has spent tens of billions of dollars annually on share repurchases, all while spending a lower percentage of its revenue on R&D than most tech firms. Apple's revenue declined last quarter for the first time in more than a decade. It's tempting to argue that if Apple had just invested more money instead of spending billions of dollars on dividends and buybacks to please a handful of fund managers, it would still be posting strong revenue and earnings growth. 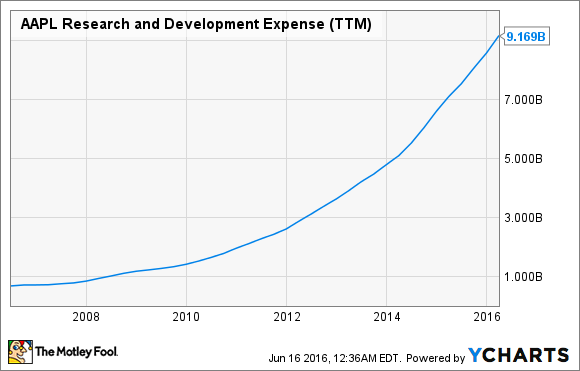 Yet Apple is on pace to spend about $10 billion on R&D this year, up from less than $1 billion a decade ago. A decade ago, Apple was in the midst of inventing the iPhone and iPad. If it can't produce anything equivalently innovative on a $10 billion budget, why would it be able to do so with a $20 billion or even a $50 billion R&D budget? It's still fruitful (no pun intended) for Apple to invest in R&D to improve its existing product lines and develop complimentary products. But based on Apple's recent track record, there's a good chance that bold investments to move into completely new areas would fall flat. In the past decade, Keurig has revolutionized the coffee world with its pod-based single-serve coffee brewers. In recent years, Keurig Green Mountain returned plenty of cash to shareholders. However, it also invested hundreds of millions of dollars to develop the Keurig Kold home soda-making machine, which was designed to be the company's next big growth driver. It wasn't alone. Coca-Cola (NYSE:KO) invested more than $2 billion in Keurig Green Mountain to get a piece of the action. The Keurig Kold system can make a variety of Coca-Cola's products. Keurig Kold ended up being a complete failure. Keurig recently announced that it is discontinuing the product less than a year after it went on sale and offering full refunds to anyone who bought one. In hindsight, it should have been obvious that Keurig Kold was a terrible idea. It was big, loud, expensive, and made small portions of soda for several times the cost of buying a can of Coke. Coca-Cola was lucky to get bailed out of its investment earlier this year when coffee giant JAB Holdings bought Keurig Green Mountain for a sizable premium. Boeing's 787 Dreamliner jet shows the perils of investing in innovation on a much larger scale. The company likely spent more than $15 billion to develop the groundbreaking, fuel-efficient Dreamliner. The development process was plagued with delays and snafus, partially because Boeing outsourced a lot of the work in order to avoid shouldering even more risk. It will take decades for Boeing to turn a profit on its Dreamliner program. Image source: Boeing. Five years into production, Boeing has racked up more than $30 billion in deferred production costs -- essentially losses on the first several hundred aircraft it produced -- and unamortized tooling costs. The total investment over the past 12 years is thus nearly $50 billion. While Dreamliner sales are finally turning profitable, it will probably take at least another decade for Boeing to recover all of its costs. By the time the last 787 rolls off the production line, the program is likely to have produced a pitifully low single-digit rate of return. By contrast, Boeing's most successful product is the narrowbody 737 jet. Boeing has invested billions of dollars improving the 737 over the years and engine manufacturers have developed state-of-the-art engines for the new 737 MAX family, but the underlying design is more than 50 years old. There's an important lesson here for investors, analysts, and policymakers. Just because a company is big and highly profitable doesn't mean that it can replicate those profits on an even larger scale by investing huge sums on R&D and capacity expansion. In many cases, the best use of cash is to return it to investors. However, a lack of innovation at the largest, most-established companies in America doesn't mean the whole economy is doomed to stagnation. Nor does it mean that their profits are being wasted on making the rich even richer. Instead, a lot of the most valuable innovation comes from young companies, some of which are not even public. Unlike the failed Keurig Kold, which was developed by a sizable and highly successful corporation, the original Keurig -- which became a massive hit -- was developed by two guys working in their kitchen and a small office, using handmade K-Cups. Three of the 10 most valuable companies in the U.S. were founded in the past 25 years: Alphabet, Facebook, and Amazon.com. For the first two, at least, the sources of their value -- the Google search algorithm and the massive Facebook social network -- were well established before they even went public. Furthermore, half of the 10 most valuable start-ups worldwide are based in the U.S. Many of these companies need to invest huge sums of money to develop their businesses. One reason why they can so readily raise money is that larger companies are returning cash to shareholders through buybacks and dividends. Thus, it's true that American companies need to invest in R&D to produce the innovative breakthroughs that will power our economy for the next century. It's just not necessarily the case that the biggest corporations should always be the ones making those investments.